The first wave of the Norman invasion of Ireland happened in 1169. 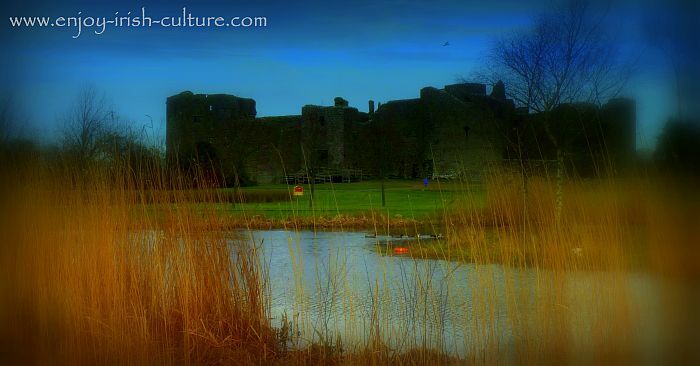 Norman Ireland saw the building of countless castles. This is King John's Castle in Limerick, built just after 1210 to safeguard the Shannon estuary after the Norman invasion of Limerick. Strongbow (Earl of Pembroke Richard De Clare) had been invited by the exiled King of Leinster Dairmait Mac Murrough to help recapture his kingdom. Mac Murrough refused to accept the Irish High Kings authority when he was exiled and had his lands confiscated after abducting a rival king’s, Ua Ruairc's, wife Derbforgaill. This abduction was part of a longstanding conflict between Mac Murrough and Ua Ruairc. It was also part of the larger picture of Gaelic chieftains being at conflict with one another. The Irish High Kings remained virtually powerless in the face of Gaelic chieftains all fighting amongst themselves. As a result, there was no strong unified Irish force ready to defend the country. Mac Murrough rallied support for his case in England which he eventually found in Strongbow. Strongbow had been deprived of his aristocratic title by Henry II and had lands confiscated in Normandy. He was looking for ways to increase his influence and power. Mac Murrough’s request came at the right time. A pact was negotiated whereby, upon conquest of Leinster, and reinstatement of Mac Murrough as King of Leinster, Strongbow would marry Mac Murrough’s daughter Aoife and thus would become heir to all of Leinster under Norman law. The Normans that invaded Ireland came from England, but originally the Normans had been Vikings (the word ‘Norsemen’ became Norman) who had conquered the Normandy in France. In 1066 they invaded England. The Normans who followed Strongbow to Ireland came in loosely organised groups led by knights. In the Norman invasion of Ireland was very successful. The first Normans landed on May 1st 1169 at Bannow near Wexford led by Robert Fitz Stephen and Maurice de Prendergast, the second wave a year later at Bagibun near Wexford led by Raymond le Gros.They erected a fort at Bagibun and awaited the arrival of Strongbow on the 23rd of August of the same year. While stationed there, they were attacked by both Viking and Irish warriors in a combined effort to drive them off, but fought them off successfully. After Strongbow's arrival they took the City of Waterford on August 25th 1169. They were interested in grabbing large tracts of land and that is just what they did. Their superior military technology helped them along, so did the fact that there was no unified Irish force opposing them. Leinster was captured in a short space of time. 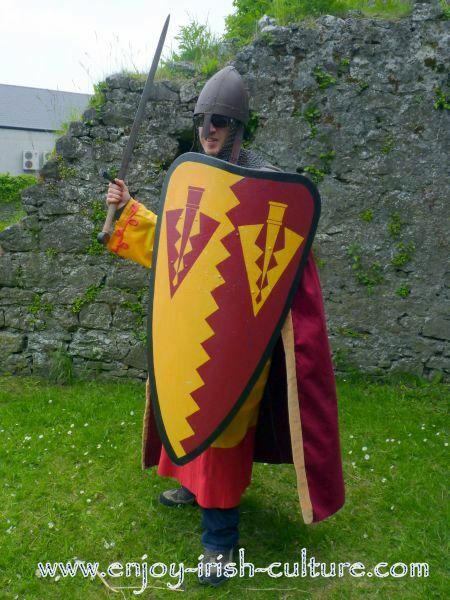 Colm dressed up as a Norman knight at Athenry Heritage Centre, County Galway. Note the large metal shield, the protective helmet, and the very long, powerful sword. Unlike the clan-based Irish Gaelic tribes, the Normans in Ireland had a feudal system in place with aristocratic titles, where the property was usually passed on to the eldest son who would inherit the title as well. The Normans recognized the English king as their ruler which set them apart from the Gaelic chieftains. Normans spoke a cocktail of languages such as French, Flemish, Welsh and English. The Normans were very adaptable. Wherever they went they adopted the existing culture and blended in. Soon after their arrival here, some Normans started adopting Irish customs and the Irish language. You may have heard the phrase: ‘More Irish than the Irish themselves.’, which was originally used referring to the Normans. Once settled in Ireland, they became referred to as Anglo-Normans. The Normans loved hunting which was one of their favourite pastimes. When they arrived in Ireland, they found no deer here. But no problem to the Normans. They set about importing deer by boat, and setting them free in Ireland to be hunted. That was how Ireland came to have a deer population. Click here to read our feature on weapons used during the Norman invasion of Ireland. The Norman medieval market town of Fethard, County Tipperary. Read about Norman castles here, how they were built and their defensive features and the associated lifestyle, and learn Norman castle vocabulary. The Normans were loyal to the English crown. However, one has to remember that the Normans themselves did not consider themselves English. Most never spoke English, but rather stuck with their native tongues, most notably Norman-French and Welsh. During the 17th century the prime conflict became about Catholic versus Protestant and it was during this time that some Normans rebelled against the English crown. A lot of Normans remained Catholics after the reformation, and during the Cromwellian invasion of Ireland in 1649, many chose to oppose the Puritan Protestant Cromwell. Galway is a good example for this. 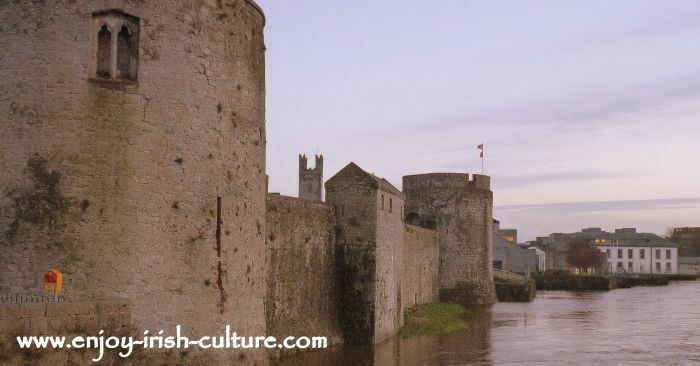 Medieval Galway was an entirely Norman town with English as the prime spoken language. Galway fought and held out against Cromwell for nine months. In fact, it was the third last town in all of Ireland, Wales and Scotland to be conquered by Cromwell. Some Normans in Galway refused to sign the articles of surrender and lost all of their lands as a result. The main legacy of the Norman invasion was the import of new technologies such as cut-stone building of fortified castles. Evidence of their presence survives also in Norman surnames, such as Burke (originally De Burgo), Butler, Cantwell, Lynch, Richardson, Tyrell, Taaffe, Dillon, Hussey, Fitzpatrick, Fitzsimons, Fitzwilliam, Fitzmaurice, Tobin, Molyneux, Devereux and many more. If you enjoyed this article and if you like what we do, please give us a social shout out on your preferred platform using any of the social features provided on this website, such as the buttons at the top left, and boxes at the bottom of the page. Your support in growing our readership is much appreciated.